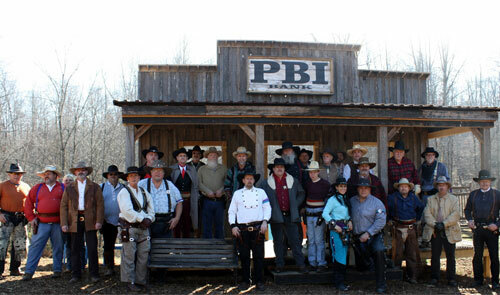 Park City, KY., – Park Mammoth Resort’s Rockcastle Shooting Center, hosted its first Single Action Shooting Society event November 28, 2010. A permanent Cowboy Action shooting range was fabricated, complete with five Old Western facade stages spread out amongst the two thousand acres on the sprawling family resort. The titled match “Welcome to the Rock” attracted over thirty competitors from five states, all dedicated to preserving and promoting the history, spirit and sport of Cowboy Action Shooting by dressing in authentic costumes. Single action revolvers, pistol caliber lever action rifles and old time shotguns either original from the 1800 period or replicas are shot by the competitors in a timed event. T-Bone Dooley, from Texas, a six time Classic Cowboy World Champion won the Outlaw Division and was the Overall Champion. Iron Maiden, the current Ladies Duelist World Champion won the Ladies division and Vaquero Jake, current Kentucky State Champion won the 1st Buckaroo Division. Rockcastle Shooting Center is the newest addition to the Park Mammoth Resort property which is developing into the nation’s premier shooting sports resort. Complete with a 15 Station Sporting Clays course, 5 Stand, Pistol and Rifle Ranges out to 1,000 yards and two 3D Archery Ranges, the Rockcastle Rangers SASS Club has recently been added to the family resort. Park Mammoth Resort was built in 1964 and continues to operate as a 2,000 acre golf resort and family recreation destination. Nestled among the wooded ridges and valleys of the historic property, it is located in the heart of Caves, Lakes and Corvette region of south central Kentucky. To book your next family get away or plan your company’s corporate outing, visit our website at http://ParkMammothResort.us or email our guest client services at info@parkmammothresort.us.